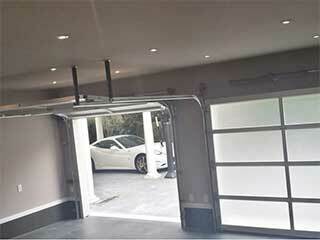 Home Our Garage Door Services Garage Door Openers Why the Doors of Your Garage Won’t Close? Why the Doors of Your Garage Won’t Close? Struggling with a garage door that won't close can be extremely frustrating. When you depend on your garage to store items or to gain access into your home, you'll naturally want to do what you can to ensure your doors do what they are supposed to do. Since these systems are so heavy and can cause harm, most automatic garage door openers today come with sensors - when something is in the path of the door, they should trigger the reversal function to stop the door from closing all the way. If the begins to closing but stops at some point, this also indicates a problem with the opener that will need to be addressed. Your sensors will be located on each side of your door and will usually have a light on them. If you notice that one or both of these lights have switched off, this usually means that the sensors need to be aligned. Once both of the lights come on again, your door should start working as usual. Our experts can help realign your sensors if you're dealing with this issue. Why Do The Sensors Stop Working? If you have a garage door that vibrates a lot when moving along the tracks, this can affect the sensors over time. In addition to this, the screws on them may need to be tightened from time to time. Before calling a garage repair technician, it is worth confirming whether or not your opener problems may be down to unclean sensors. All you need to do is wipe the sensors free of any dirt or dust and see if there is any change in performance. If your door works again, you can put the malfunction down to dirt. Rather than attempt to sort your sensor alignment issues yourself, it's always best to call a professional. This can be pretty tricky to get absolutely right and you don't want to risk further damage to your system. Call our experts at Brushy Creek in Texas for advice and assistance. Overhead garage doors are complicated machines. Luckily we're here to provide expert repair, installation and diagnostic services, regardless of the make and model you have installed. Explore our site to learn more about our team of experienced technicians and the services we offer. Our technician will contact you before arriving. Until then, feel free to browse our website! Garage Door Repair Brushy Creek is at your service!